No more updates. Sorry guys, but I've kind of stopped playing MC, and I forgot about PMC for two years. But if you're here. You probably want to download, so I'll give you a breif description. This mod basically adds a Herobrine Hostile Mob to the game. Does this mod work for Xbox 360 edition? I don't know what to do I downloaded the mod and tried to craft the herobrine totem and it didn't work. please respond as soon as possible. You can't be more invimicimaniblar than me. I gave up man. It's useless. I'll never be good at mods. why did you close the prodject??!??! You can still download it, but your minecraft might crash. That's why I closed it. Whenever I download it, (I already have ModLoader and deleted META-INF) It causes Minecraft to crash. Is there a way to fix this? I don't have any other mods by the way. This mod is now a closed project. No updates anymore. Download if wanted, but this mod is not going to update. That's why I closed project. well, what does he do? i have been wondering are you a ledgend of korra fan? It works on my computer and i don't have to use modloader, but i have forgot ,that what herobrine does else than place signs drop my torches and sometimes replaces them with redstone torches. This does not work, and I know why. When it crashed it said that the naming was incorrect mod_herobrinezekadeo is the public class for mod_herobrine. Just get rid of the zekadeo and you'll be fine. I did what you mentioned and the mod didnt cause any crash, but I cant seem to find any herobrines--I dont know if herobrine will spawn anywhere. Does he spawn in your world? I haven't edited the code, so I don't know. 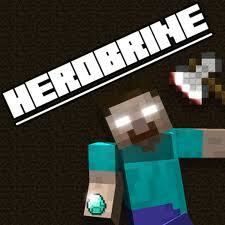 I use burnner's Herobrine Nightmare mod though, try that one out; its great. wont work for me. i have other mods like too many items and i have modloader 1.3.2 why wont it work? can it open levers? and doors and crap? Modloader? DO you have it? Could you please psot when the mod is done because it looks awesome!!! maybe make it so he can place blocks idk just an idea GREAT MOD! Is this for 1.3.2 yet? because some mods are 1.3.2 but say 1.3.1 on planet minecraft just asking. yay a way to scare friends!!!! do they need to have the mod installed too? SWEEEEEEEEEEET! This is definently getting a Diamond! Thanks heaps man! :D Love the look of this mod.